It’s not easy to get the attention of the world these days. For an author, it takes a series of happy coincidences and hard work to get one’s work into the hands of readers- this is a lesson I’m currently in the process of learning, having published my first book. I’ve put plenty of labor into promoting my book through various venues and websites- I’ve seen some success for it. One avenue that hasn’t been particularly successful, however is Facebook. In spite of having poured much time and effort into attracting people to my Facebook page, the things I post aren’t reaching the audience I’ve worked so hard to secure. According to Facebook, around 10% of the people who liked my page ever actually see my posts- that’s pretty abysmal. I have been offered the ability to “Boost” my posts and increase the number of people who see them. 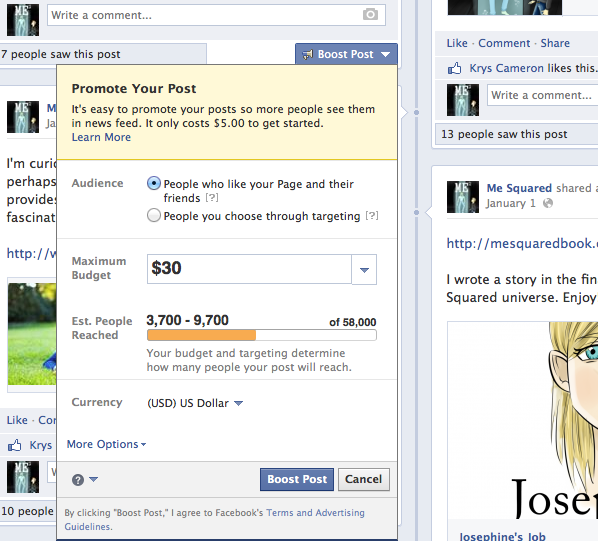 I can give Facebook extra money in order to reach the audience that I’ve worked so hard to build. To be honest? I’m not particularly upset by this; while it’s frustrating, people tend to “Like” a great many Facebook pages- it can be easy for posts to drown in a sea of content. When I visit Facebook, I only ever see posts from a few of my friends and the pages I’ve liked- these are usually the friends I interact with online the most often and the pages I’ve given the most attention to. It makes sense having people pay to advertise to their audience; creating a page on Facebook didn’t cost me anything but a bit of time. Your ad account has recently been flagged because of unusual activity. 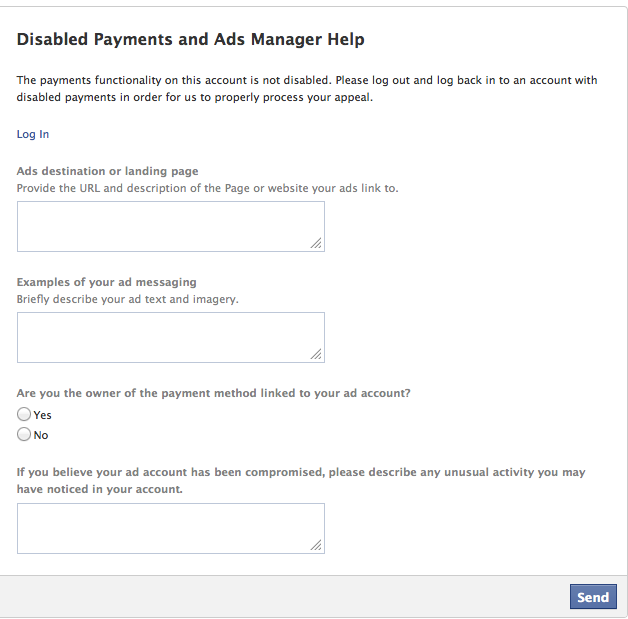 For security reasons, any ads you’re running will be paused until you can confirm your account information. Contact Facebook. I can’t report a problem with an ad, because I’ve never had an ad to begin with. This isn’t the first time I’ve had a problem with my Facebook account- some years ago, I didn’t upload any pictures of myself to Facebook- my account was automatically flagged as “suspicious” and banned until I contacted Facebook. Apparently, having no pictures of oneself is regarded as suspicious, and a reason to be banned. A bit unusual, but easily remedied. After I did a little more digging, I found my transactions page. According to it, my ads should “not be run again on the site under any circumstances.” That’s interesting, since I’ve never run any ads on Facebook. I haven’t violated the rules, and they refuse to specifically explain what I did wrong- frustrated, I sent them an e-mail explaining my situation via one of their feedback forms. A little message popped up a moment later telling me, in the friendliest possible terms, that their inbox is a swirling black hole filled with the tears of myriads, and there’s little guarantee that I’ll receive a reply. Lovely. Later, I stumbled across a chat feature that put me directly into contact with Facebook’s tech support- I chatted with a friendly representative and gave him the information he needed- he took a peek at my account and told me he’d forward my information to the right folks, and that I’d be helped in 24 hours. Thus began the waiting game. I waited 24 hours, and nothing happened. I waited another 24 hours, and I only got e-mails telling me that my friends posted cool stuff on on Google Plus. By 72 hours, I couldn’t shake the feeling of that they forgot me. The promised e-mail never arrived, my account remained in limbo, and Facebook began to mock me- telling me to go finish my ad. The irony of my friend’s post is not lost on me. So, besides the extraordinary Facebook drama, the author life has been pretty decent- I’ve been hard at work writing my next book (I’m not saying what it’s about quite yet). I’ve also been reading- I’m working through Colfer’s Airman and absolutely love its simple prose and setting. The plot and characters are pretty nicely developed as well. Also, watch this space- I’ll be posting a nicely edited version of Josephine’s Job some time soon. Also, my sweepstakes is nearly over- check it out if you haven’t yet, you could win a $25 Amazon Gift Card!